Gross Shipping Weight 476 LBS. Net Weight (without bottles) 404 LBS. My EuroCave is 3 yrs old. I noticed today some frosting on thr back wall. The wood oanel on the bottom is also “decaying” as if it has had exposure to too much humidity and/or direct exposure to water. any suggestion la how to fix? Does the door have to open more than 90 degrees in order for the shelves to be pulled out? BEST ANSWER: 90 degrees is enough, if I understand your question. The door needs to open so that it extends straight out, in line, with the side of the cooler the door is on--or more. Anything less blocks the doors from sliding out. It is always a good idea to leave about an 1/4 to 1/2 inch space on each side of the doors but no the door does not need to open more than 90 degrees to get the shelves out. The door has to be open nearly 90 degrees to get the shelf to pull out all the way. You may be able to pull out partially with slightly less than 90 degrees. The trays can be partially pulled out if less than 90 degrees. However to get the full tray pulled out it must be 90 degrees. No, if you are getting to the bottles on the front of the shelf 90 degrees may not be necessary either. No. You can pull out the shelves with it open at 90 degrees. Yes, quit a bit more! BEST ANSWER: Technically you can fit 74 bottles on an adjustable shelf but given that you have 10 rolling shelves in the unit it is going to limit you to roughly 48 standard bordeaux bottles roughly but it all really depends on bottle size. Do I need clearance on the sides for the hinge / door? BEST ANSWER: No. The door opens flush with the side of the unit. No additional clearance is needed. I have 180+ degrees clearance with the door hinge. It's great. You can get away with 90 or 95. Challenge will be first load. After that, daily access with only 90 is okay. Make sure you leave 3-4 inches clearance all around it though! Can't be pushed directly against wall. I love this cellar! Let me know if you have more questions. Thank you. I dont have 3-4" on the sides. Is the space needed for circulation, or for the doors to swing open enough for the shelves to slide out? The clearance is necessary for the compressor to work properly. Most important behind it. I do think at least 2-3 inches on the side with hinge is needed. You want it to go slightly beyond 90 degrees for loading and access. I would leave at least 1/4 to 1/2 inch. This is a back venting unit so you will need 3 inches behind it for ventilation. I have a spot in my garage that is perfect for this cellar to stand. Concern is my garage gets to 90 fro several days a year. Will the double pane glass be capable or do i need to go with the solid wood doors? Can these units stand that high of heat? This is the perfect cellar for your garage. I would recommend going with the solid doors. These units are designed to function in those type of environments. I have three of these in a storage room off my garage in South Florida where it is 90 degrees for several months each year. I would only use a solid door-not glass. Is the Premiere Double L Wine Cellar 2 separate L units? BEST ANSWER: You are correct, the Double is simply one unit with a right hinge and another with a left hinge. Each unit has its own electric cord and compressor. This is a great addition our our garage. Live the storage capability however I don’t think it holds as many bottles as advertised. I researched and waited way too long to decide on this model. It is so well-made, easy to handle and quiet. There are only positive things to say about the product, the service and the delivery. I would purchase this without hesitation. This was just what we were looking for! We were looking for something really quiet and it certainly is that! The delivery and set up were seamless! Very happy with the two Eurocaves, very efficient and quiet. Easy to install and set up. Came to proper temperature in three hours after turning them on.......holding steady temperature since then. Just turned them on and filled with wine one week ago, so, a bit too early to comment on their ongoing performance. 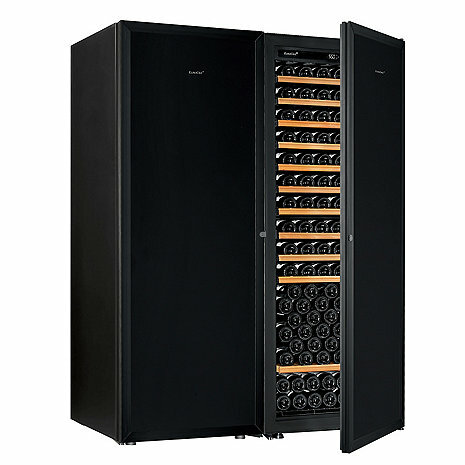 I bought a 200 bottle capacity from Costco made by EuroCave but it was most likely lacking features for the price. It leaked water in the garage and had to be returned. I bought the double L from wine enthusiast with the solid doors and it works and looks great. I have mostly one liter Caymus but with the 300 bottle capacity have been able to fit 130 Caymus and 80 others. This is just what I expected and am happy with it.